Being a member on Movie Poster forums and various groups I’ve heard and seen many horror stories of packages arriving with severe damage. At timelessmoviemagic we take extra care in packaging and we realise that the poster the customer has purchased from us could be one they have searched for many years and may not come across it again. So we thought we’d do a step by step blog guide on how we pack. 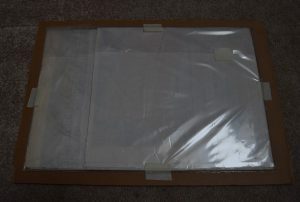 Place the film poster into the protective sleeve. When handling the film poster please use cotton gloves. This stops the oils in your fingertips creating smudges of the poster. Most sleeves have an adhesive line so you can secure the film poster in the sleeve to stop anything getting inside. Then we fold the top over to make sure it has a snug fit with the side of the lobby card/film poster. We then use a small piece of tape to hold this side down. Next thing we do is get two sturdy pieces of cardboard at least 7mm thick. Then we cut four small pieces of tape and attach the sleeve to one piece of the cardboard. It is important that the pieces of cardboard are at least one inch larger than the sleeve on all four sides. This will help protect the film poster if it takes a nasty knock in transit. Once the sleeve is attached place the other piece of cardboard on top and secure both pieces together. We tend to use two pieces of tape on each of the longer sides and one piece of tape on the shorter sides. Then for extra protection we use vinyl tape and securely tape around all the edges of the cardboard. Once the tape is secured we place the package inside a cardboard envelope. We use a company called Defendapack to supply us with these envelopes. This will ensure the package is delivered safely to its destination. We have seen many bad practices when packaging up film posters. Here are just a few of them that stand out. 1. 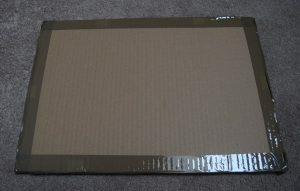 We have received packages of a film poster placed in an envelope with no protective sleeve or cardboard to protect it. This increases the chance of the film poster being damaged considerably. 2. 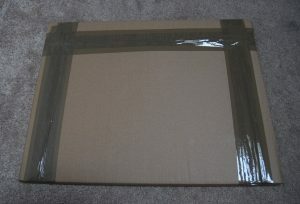 We have seen packages with the poster in a sleeve and secured to cardboard but tape too close to the edge. The package has had a knock and this has caused damage to the poster. 3. On very few occasions we have heard of packages being left out on the doorstep or next to the front porch, even in the pouring rain! Some packages have become so sodden that the poster has been water damaged. By placing the poster in a protective sleeve and vinyl taping all the way around you will eliminate this possible scenario. 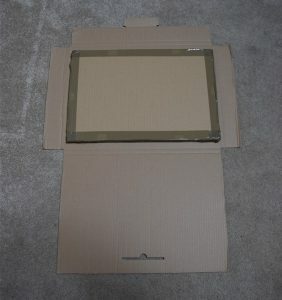 Place the film poster in a protective sleeve. Sandwich the film poster between at least TWO pieces of at least 7mm thick cardboard. 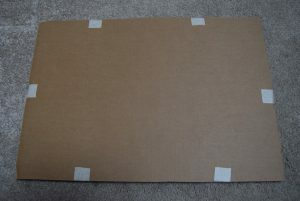 Tape the poster to one piece of cardboard leaving at least one inch of space all the way around. 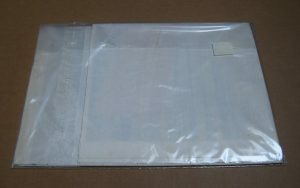 Use a cardboard envelope for extra security and protection. We will soon be releasing a video demonstration on our YouTube channel showing how we pack our folded film posters and lobby cards.